An early review of my book…. | Peggy D. Snyder, Ph.D.
An early review of my book…. Posted on October 12, 2013	by Peggy D. Snyder. Ph.D. 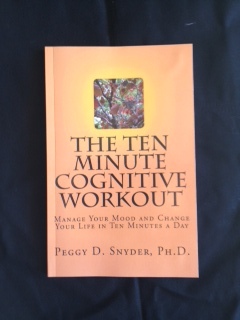 The Ten Minute Cognitive Workout describes and teaches you a simple, easy to learn exercise designed to manage mood and change behavior. As the title suggests, the exercise requires an investment of only ten minutes a day. Despite its ease of execution, the Ten Minute Cognitive Workout is surprisingly powerful. It’s based on the principles of Cognitive Behavioral Therapy. What we think directly affects how we feel. Our thoughts govern our emotions. The Ten Minute Cognitive Workout shows you a simple way to replace negative, irrational, dysfunctional thoughts with positive, rational, functional ones. These new thoughts become internalized and produce positive changes in emotions and behavior. This entry was posted in Uncategorized and tagged Cognitive Behavioral Therapy. Bookmark the permalink.